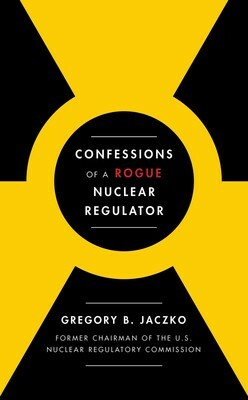 Confessions of a Rogue Nuclear Regulator, by Greg Jaczko. Simon & Schuster, 2019. Greg Jaczko’s talents of mastering how to gain, hold, use and lose power in Washington, D.C., reminded me of the questions I was afraid to ask in civics class. With the support of Senators Harry Reid of Nevada and Ed Markey of Massachusetts, Jaczko was an effective holdout for real regulation of nuclear power plants—until he wasn’t. Confessions of a Rogue Nuclear Regulator shows how tax dollars go from our pockets to the nuclear industry with a little bit to the lawmakers who pass laws to give more taxes to the nuclear industry. Legislators install pro-nuclear persons in the Nuclear Regulatory Commission making the system invulnerable. Lesson 1: Accidents in nuclear power plants are forgotten as soon as possible, with a constant drumbeat to proclaim them harmless. That accidents will happen is not admitted. Therefore, the response to accidents, even though planned on paper—called “design-basis”—doesn’t include worst-case scenarios. Design-basis reaches the outer limits of planning for accidents. Obviously, the nine-point Tohoku, Japan, earthquake, its 128-foot wall of water and six-mile inland reach exceeded the design-basis. Likewise, Three Mile Island and Chernobyl. Lesson 2: Regulations don’t have to be followed. The Browns Ferry Tennessee fire, 1975, generated a flurry of regulations—never enforced, even at Browns Ferry. They required re-designing wiring systems and the creation of unique spaces for large bundles of conduits, thus becoming prohibitively expensive. So the flurry of regulations was followed by a flurry of amendments, exemptions, resistance and delays. Lesson 4: We have to stop making nuclear waste. The geological and political objections to Yucca Mountain as a permanent repository are formidable and final. “After thirty five years the Yucca Mountain project was over” (p. 67). The search for a suitable permanent waste dump must begin from scratch and will take decades. In the meantime, nuclear communities are stuck with the waste created on their soil. Lesson 5: Nuclear energy cannot be made economical. The only nuclear projects started in the U.S. since the Three Mile Island accident (1979) are Vogtle in Georgia and units 2 and 3 at V.C. Summer in South Carolina. Construction of the South Carolina units was called off after $9 billion was spent, a cost that will be passed on to the federal government and South Carolina ratepayers. Vogtle, on the other hand, lumbers on, in spite of having projected a cost of $4.14 billion which has increased by five times to about $25 billion and the bankruptcy of its major construction company, Westinghouse. Greg Jaczko, alone on the NRC, voted against licensing either of the plants because they didn’t incorporate the safety lessons from Fukushima (and Davis-Besse, and the almost-flooded out Fort Calhoun plant in Nebraska). In summary, Jaczko, with serious intentions to regulate nuclear power plants, became Chair of the NRC. However, the power and money behind the nuclear project thwarted those intentions and Jaczko was removed after three years. This entry was posted in Alerts & Appeals, Articles and tagged Browns Ferry, Chernobyl, Fukushima, Greg Jaczko, January, Nuclear power, Nuclear Regulatory Commission, South Carolina, Three Mile Island, V.C. Summer, Vogtle. Bookmark the permalink.